My 7 year old daughter wanted a Monster High cake, so I decided to utilize some of the legless dolls that hang around our house! To do this I used a pampered chef batter jug/bowl and used a double size Victoria sponge recipe. 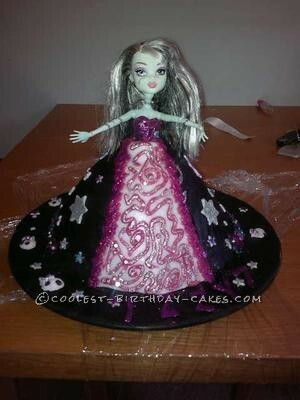 I covered the cake in black fondant, made a hole then shoved the doll in center! Then used stars cut out of white fondant covered in pink glitter and repeated for the name and age. I used silicone molds to produce the skulls around the bottom of the cake, and then piped in pink gel icing the front of the cake and covered in pink glitter.